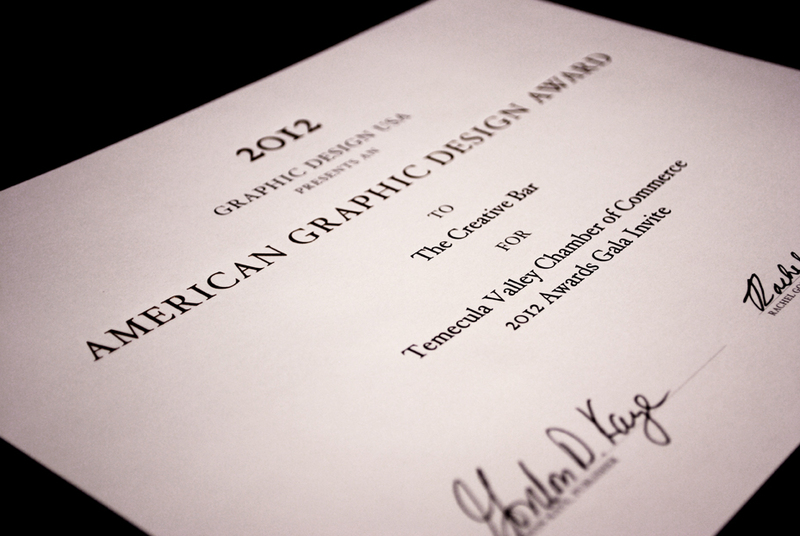 The Creative Bar, a leading Southern California design, marketing and advertising firm, was honored to be selected as a winner in the 2012 American Graphic Design Awards for the Temecula Valley Chamber of Commerce Annual Awards Gala Invitation. This marks The Creative Bar’s tenth award received so far in 2012. Since 1963, Graphic Design USA has been the news magazine for graphic designers and other creative professionals. Since then they have sponsored national design competitions that spotlight areas of excellence and opportunity for creative professionals. The American Graphic Design Awards is the biggest and broadest of these, open to everyone in the community: graphic design firms, advertising agencies, in-house corporate and institutional designers, publishers and other media. It honors outstanding work of all kinds and across all media: print and collateral, advertising and sales promotion, corporate identity and logos, internet and interactive design, packaging and p-o-p, broadcast and motion graphics. For the fifth straight year the American Graphic Design Awards accepted more than 8,000 entries. Yes, I sign me up for the The Creative Bar newsletter!